Security, comfort and a lot of love will be some of the your cat’s most basic needs. But he will have a few tangible needs as well. Cats are true carnivores. High-quality wet food is great for your cat, keeps his teeth healthy and is a good source of protein. Feed your cat wet food two times a day. Avoid grains and too many carbohydrates. Be as consistent with the feeding time as possible. Read the labels to determine serving sizes and check ingredients. Your cat should always have access to fresh water. It should be changed at least two times a day. Filtered, purified or bottled water is optimal, but fresh tap water is OK too. Cats do not like to bend their whiskers while eating or drinking, so make sure that the bowls are large enough to accommodate. Remember, cats are very sensitive to smell. If your cat is not drinking from his water bowl, thoroughly wash and rinse the bowl and try again. You can also try filtered water. A typical day for a cat includes about 16 hours of sleep and four to six hours of grooming, playing, hunting, eating and exploring. Make your cat feel right at home by providing him with a few places to sleep. Cats like to sleep and perch in high places. They like the security of seeing everything that is happening below and around them. Cat beds, cat trees, baskets and pillows are great ways to give your feline friend safe, secure spots to call his own. Ensure your cat has access to his favorite spots by checking closets or rooms before closing a door. Cats are known to sneak into rooms or closets and run the risk of being inadvertently locked in. Providing an enriched indoor environment full of positive stimuli will lay the groundwork for a happy, healthy cat. Cats live happy, fulfilled lives indoors and avoid life-threatening diseases and dangers that lurk outside. The average lifespan of an outdoor cat is 1 to 3 years. That extends to 15 years for indoor cats. Wild cats roam because they need food, water, and shelter and, if not spayed or neutered, always have the urge to mate. 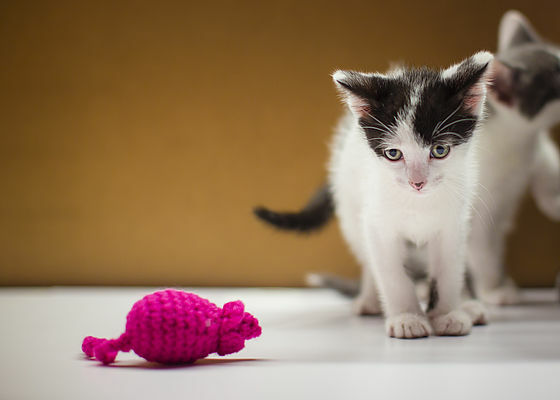 Providing your cat with a variety of toys that you change out periodically can help keep him happy. Play with or pet your cat in different rooms. Schedule at least 15-30 minutes of cuddle and playtime with your kitty twice a day. Talking to your cat and giving him lots of friendly praise or quick strokes will further solidify your bond. Spaying or neutering is essential. Your cat’s basic grooming needs include nail trimming, brushing and dental hygiene. Whether you do it yourself or outsource to an expert, read all about what’s best for your cat in Grooming. Dishware: We recommend stainless steel, glass or ceramic food and water bowls. Avoid plastic containers. Toxins in the plastic and the porous material encourage bacterial build up and can cause an infection or acne on your cat’s skin. Litter Box(es): The general rule of thumb is having the same number of litter boxes as cats, plus one. Your cat should be able to comfortably enter the box and have plenty of room to perform his elimination ritual of sniffing, digging, squatting, turning around and covering up the feces. You may want to avoid covered or hooded litter boxes. They tend to trap odors inside and do not satisfy a cat’s need to escape potential threats when eliminating. You may need to experiment to find out which kind of litter box your cat prefers. Litter: Cats typically prefer litter that is unscented, made with few or no chemicals, absorbent, soft to the touch and rake-able. A brand that clumps into a firm ball makes scooping easier and cleaner. Some people prefer pellets. There are litters that are environmentally greener than others. Consider clumping recycled products, such as recycled wood litter,or walnut shells. Avoid litter made of wheat or corn. They can be inflammatory if the cat licks the dust off himself. If you want to experiment with different litter types, we recommend keeping a traditional litter box, in addition to the new litter, to learn your cat’s preference. Place at least three inches of litter in the box. You can try plastic liners to prevent urine from sticking to the bottom. However, litter box liners and scented litter can be irritating to some cats. The most important thing is to keep your box clean. Scratching Post: Scratching posts are best when they are hung or are tall enough to be approximately 30 inches off the ground. This allows your cat to fully stretch his legs. The best ones are made of soft wood or wrapped with sisal rope and mounted on a stable base that won’t tip. Avoid giving your cat string, yarn, floss, ribbon, twine, rubber bands and bells. Due to the barbs on a cat’s tongue, they have trouble removing these items, which could cause them to swallow them. Catnip: Catnip has a remarkable effect on cats. It stimulates and relaxes them at the same time. Catnip-stuffed toys heighten the cat’s interest in stationary toys that would otherwise be considered dead prey, lifeless and boring. Carrier: This is another essential item.